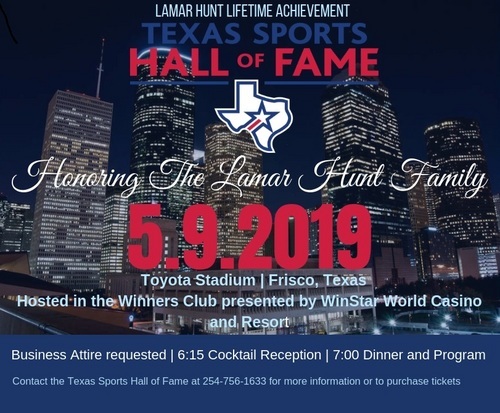 Waco, TX, (March 22, 2019) – The Texas Sports Hall of Fame (TSHOF) is pleased to announce that the family of Pro Football Hall of Fame member, Kansas City Chiefs Founder, former FC Dallas investor-operator and American sports pioneer Lamar Hunt has been selected as the 2019 Lamar Hunt Lifetime Achievement Award recipient. Current Kansas City Chiefs and FC Dallas Chairman and C.E.O. Clark K. Hunt will accept the award on behalf of the family. The Hunt family becomes the seventh overall recipient, joining fellow professional sports franchise owners Donald Carter, Red McCombs, Drayton McLane and Bob McNair as well as Texas sports dignitaries Dave Campbell and Rudy Davalos. The Lamar Hunt Lifetime Achievement Award, established in 2006, honors an individual/s who has achieved special acclaim by being influential in enhancing Texas sports history. The criteria include having had, throughout the course of one’s life, a significant and positive impact on the landscape of Texas sports. The Lamar Hunt Lifetime Achievement Award represents the highest honor bestowed by the Texas Sports Hall of Fame and past recipients are among the great sports leaders of our state whose vision and service in the world of sports have left a lasting legacy. The event will be held Thursday, May 9, 2019 in Frisco, Texas, at FC Dallas’ home, Toyota Stadium, in the Winners Club presented by WinStar World Casino and Resort. A private cocktail reception will start at 6:15 p.m., with a dinner and award ceremony beginning at 7 p.m.
Tickets for the 2019 Lamar Hunt Lifetime Achievement Award gala can be purchased for $750 or a table for $5,000. All ticket and table purchases are tax-deductible. The proceeds of the dinner will benefit the ongoing mission and educational outreach efforts of the TSHOF, as well as the establishment of a permanent endowment in honor of Lamar Hunt and the Hunt family at the TSHOF. The Texas Sports Hall of Fame and Museum, located in Waco, Texas, chronicles the heroes and legends of Lone Star State sports at all levels including high school standouts, collegiate athletes, Olympians and professionals. Established in 1951, the organization’s mission is to preserve the legacies of all inductees and the history of sports in Texas to educate and inspire guests of all ages. Home to over 350 Texas sporting legends, the museum also hosts the Texas Tennis Museum, the Southwest Conference Gallery and Hall of Fame, and Texas High School Football Hall of Fame. For more information, please visit http://www.tshof.org.